If you fancy taking a walk on the wild side this summer and sunning yourself on an exotic getaway, then you definitely don’t want to miss Mr Green Casino’s Jungle Spirit Giveaway. This amazing offer will treat one lucky winner to a luxury holiday in Bali and plenty more players will come away with massive amounts of cash. The winner of the top prize in the Jungle Spirit Giveaway will be whisked away with one guest to the tropical isle of Bali, where they will enjoy a two-week stay in a magical treehouse in the lush, rainforest region of South Kuta. Could it be you? The Jungle Spirit Giveaway will be active at Mr Green Casino from the 21st until the 31st of March. During this time the challenge is on for you to climb to the top of the leaderboard by earning points. Every £10 of real money you wager on the slot, Jungle Spirit: Call of the Wild will earn you one point on the leaderboard. The board is updated on a regular basis so you can keep a close eye on how you and your competitors are doing. 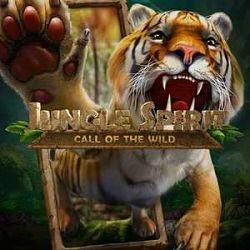 Jungle Spirit: Call of the Wild is a beautifully designed slot by Netent, set deep in a tropical, colourful jungle. The 3D graphics in the game depict all sorts of wild animals like tigers, bears and crocodiles as well as standard card values that look like they have been carved out of stone. To really add to the atmospheric vibe of the slot, there is an optional soundtrack so you can listen to whatever you like. Take your pick from enchanting tribal drum beats and the relaxing sounds of nature. Jungle Spirit uses a 243 ways to win structure and has five reels. By setting the value of your coins and bet level, you can select a betting stake from as little as 20p or as much as £100 per spin. You’ll find plenty of exciting bonus action on the reels of Jungle Spirit, such as the Butterfly Boost. This beautiful feature is triggered randomly and sets off a kaleidoscope of butterflies fluttering across the screen. The symbols they land on will become expanded, making for some big wins. Once you’ve made your selection, the amount of free spins you’ve received will be revealed. All registered members of Mr Green Casino, new and existing, are welcome to take part in the Jungle Spirit Giveaway. Every £10 made with real money on Jungle Spirit: Call of the Wild will count as one leaderboard point. All runner-up prizes won in this promotion will be paid out as real cash and therefore free from any wagering requirements. It is the sole responsibility of the holiday winner to ensure that they have a valid, in-date passport and any other necessary travel documents. No refund or compensation will be made by Mr Green in the event that a winner cannot travel for personal reasons.